I think my skin is in a constant state of being parched, no matter how much water I drink. I’ve sort of resigned myself to a life of early-wrinkles but that doesn’t stop me trying to quench my thirsty skin! One for an emergency boost is the Niod Hydration Vaccine – I wouldn’t use this everyday, but when I do, I notice the difference in my skin the morning after. It essentially acts as a seal on the skin to keep all water in and to prevent the skin from becoming any more dehydrated. I use it under moisturiser. 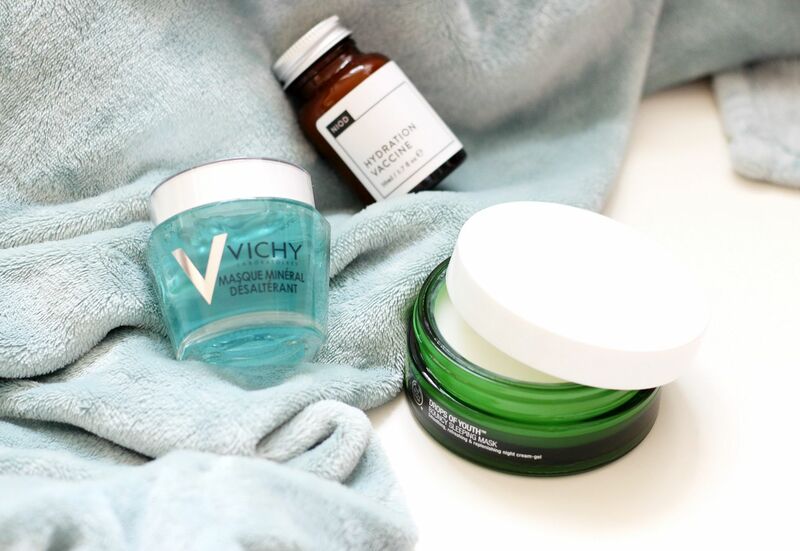 I have forever been in love with the Vichy serum, so the Vichy quenching mineral masque was a very welcome addition to my skincare stash. It’s a lightweight gel that is so perfect for dehydrated skin – it’s not heavy but leaves behind such an intensive boost of hydration. I haven’t been washing it off because my skin needs all of the moisture, and it just dries down in about ten minutes on my skin and then leaves everything feeling smoother. Anyone with dehydrated skin needs this! Lastly, an overnight booster – the Body Shop bouncy sleeping mask. Such a weird, but fun, texture – it’s almost stretchy and unlike any other skincare product I’ve tried. It really is bouncy, which is so odd! The plus side is that my skin feels ever so much bouncier when I wake up – mimicking the effect of drinking endless cups of water. If you have parched skin, how do you cope?